Audra Jennings: What exactly is a Texas name? Last week while I was gone, you got mostly book posts. So this week, you're getting the run down of last week. I hope you are enjoying it. I'll be mixing it up again soon enough. I thought I might change it up today, but plans change. Especially, when I'm trying to get a project completed for work. One thing that happened last night after I sent the email is that when we got off the boat and got a cab, the ignorant driver did not know where the place we told him we wanted to go was. He asked us how to get there and we told him that he was the driver! This morning we went to find where the train station is for tomorrow. We finally found it, but the building is under renovation and the station is in a hole. 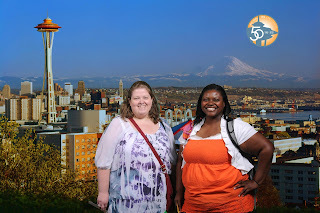 Then we went via monorail to the Space needle area. This monorail inspired Walt Disney. 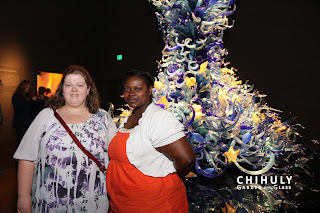 We went to the Chihuly Glass and Garden. He's the artist that did the cool glass currently up at the Dallas Arboretum (but was broken in the hail storm). It's the picture that I sent Paige earlier. It was beautiful. I took tons of pictures. 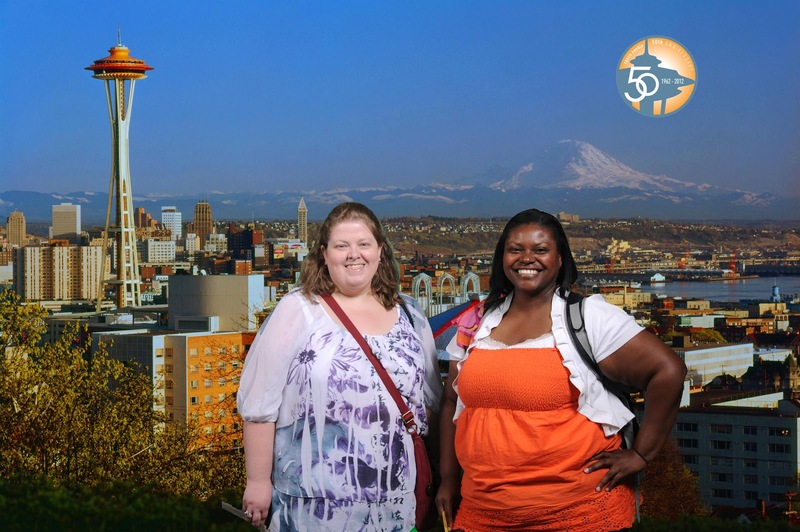 After that, we went to the Space Needle. Pops would hate it. It's tall and you go up a glass elevator. I don't know how many stories it was. From up there, we could see the faintest bit of Mt. Rainier. It was pretty foggy/cloudy so it was kind of ghost like. Later, it was sunnier, and you probably could have seen it better. After 2, Amy met us to take us to lunch and to ice cream. The salted caramel ice cream was great. She dropped us off back at Pike's and we sort of saw them throw fish. Long story. We found a shop we didn't see before, and we bought stuff. Flying on vacation and shopping and trying to pack heavy bags back is not a good combo. You all have something in my bag. We also went on the giant Ferris wheel. Pops would have hated it. It had glass enclosed cars and takes you right over the water. The first time when we stopped for people to load we both thought we may have made a mistake. Otherwise it was great other than the time we were stopped and started just randomly swinging. Needless to say, this one was bigger than the one in Houston that goes over I-45. This one was probably about the same size as the Texas Star at the state fair. On the train home, we talked to two guys than train at an Army officers training school. It was quite entertaining because we talk to everybody. (Well not everybody.) By the way Rakia and Audra are not Texas names according to one them. Tonight we had to pack up so that we can go to Vancouver tomorrow. The next two nights I won't email due to the data rates going to Canada. I went to summer youth series and I was so bored to death but besides that I had fun but I wish you were there! Wednesday went to Dallas well because its a long story but besides that i did get my upgrade in Dallas and Peyton got a prepaid phone for vacation so don't worry her phone will be broken and out of minutes before we leave. We went to Fairfield and Courtney took Mike her boyfriend to meet Granna. They are getting serious and I don't know about that???? Today We are going swimming at Nana's and relaxing. I'm glad you had fun on all the things Pops would not like. I wish I was there Baq Baq I miss you and take me to Seattle next trip I will fit in your suitcase and we can leave all your clothes and gifts there!!!!!!!!!!!!!! Well except for my Quacker! The day I headed home, Paige, Peyton and the rest of my brother's crew headed to Disney World. We're having withdrawals from one another because we have spent so much quality time together this summer. She's not been emailing from Disney World, so I can't wait to hear their adventures. I did get some texts today that they should be back home tomorrow night. Total side note, but I did get my dad a Space Needle cap that he said he loved as soon as he saw it and knew for sure it was his.